Pattern colour: Head and pronotum pale reddish brown, elytra metallic blue, with basal third or more of intervals 1-2 (including scutellum) reddish brown. Pronotoum: Narrow and slightly elongate, sides sinuate. UK Priority Species data collation Brachinus sclopeta. Status: Occasional specimens from Kent and Sussex until 1928. Several found in London since 2005. Other notes: Elytra broad and short, widest at or just behind middle, finely pubescent; apices without fringe of setae. Wings present. Jones, R.A. (2006). 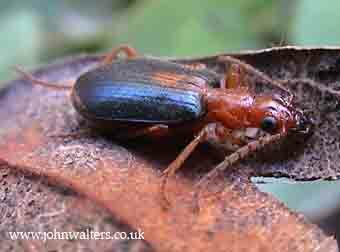 Brachinus sclopeta (Fabricius) (Carabidae) confirmed as a British species. The Coleopterist 15(1): 29.